SAINT PETER, Minn. – The Gustavus women’s tennis team started its season this weekend with the Gustie Invitational. In the Invitational there were eight draws for singles as well as four draws for doubles. The Gusties saw two indivuals win first in their draw as well as one pair of doubles. Lilly Hartmann (Sr., Cedar Rapids, Iowa) got her season off on the right foot winning all three of her singles matches, as well as winning all three doubles matches for Gustavus. 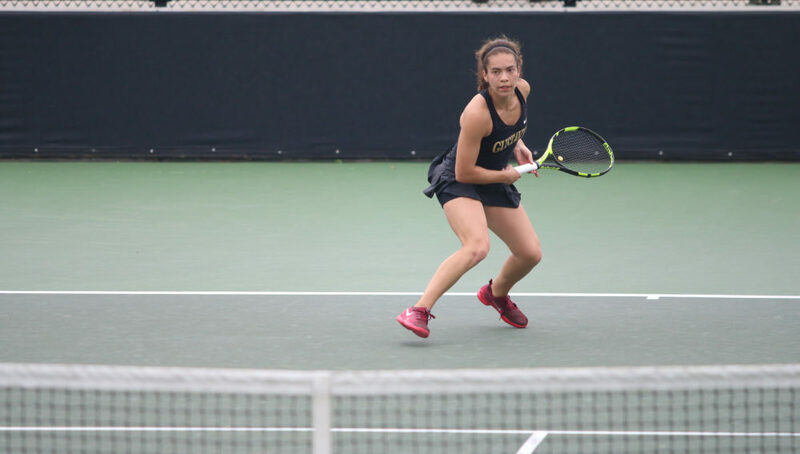 Her doubles partner, Briana Hartmann (Sr., Owatonna, Minn.), recorded the three doubles wins as well as a second place finish in singles, losing to her teammate, Ginger Valentine (So., Delano, Minn.), who won all three of her singles matches for the Gusties. On the singles side, the Gusties saw seven other members that won two of there three matches. Those singles include: Hannah Borgh (So., Bettendorf, Iowa), Sydney Douglas (Fy. ), Kjorte Harra (Jr., Eagan, Minn.), Rachel Lindrud (Fy. ), Sarah Link (Sr., Inver Grove Heights, Minn.), Anna Stutz (Fy. ), and Ally Thorsen (Sr., Eden Prairie, Minn.). Other notable doubles finishers for the Gusties include the duos of Rachel Fanciullo (Fy.) and Link, as well as Simona Potockova (Fy.) and Stutz who each finished the weekend with two wins. The next action for the Gusties will be Friday, when they open up the ITA Division III Midwest Regional Championships.